New landscaping opportunities can be an exciting prospect for any homeowner. A beautifying transformation about to breathe new life into your property should be met with anticipation and happiness. But there are certain steps that need to be taken before ground is broken on your next big home improvement project. Much like one might have to diet or take specific medication prior to surgery, so too does your yard need to prep for the massive overhaul that comes with landscaping additions. But what do you need to do to get ready for your landscaping project? How will you know if your home is ready? What can be done to make the process simple and drama free? You want to make sure to remove dead, dying, or diseased branches from any plants and trees. The ideal time to undertake such a task would be in the winter, when plants and shrubs are not growing. Pruning at this time prepares them for healthy growth come the spring. Many of these plants, shrubs, and trees don’t require hard cutbacks, which can leave them looking thin and ugly. Instead, a simple cutback will give them an opportunity to grow in a more aesthetically pleasing manner. This process ensures that, when new landscaping is installed, it won’t run into overgrowth issues. It is important to maintain a map of your yard’s permanent structures. Potentially hazardous obstructions such as underground drainage or wiring need to be properly marked prior to any work being done. There are three main wires that can be run underground. They are cable, electric, and phone. It is important to survey the property and mark these important utilities. A breach in cable wiring could lead to an interruption of your television, internet, and phone services. Striking a live electrical wire could have potentially fatal results. Another important utility to properly survey is water piping. A rupture in an underground water pipe could lead to hazardous flooding on your property, on top of interrupting your home’s water supply. Flooding can lead to dead grass, lawn fungal disease, and even in-home flooding, which could see the growth of harmful mold. Before undertaking a large-scale landscaping project, it’s a good idea to test out the soil you’re planning to use for flowers or vegetable gardens. You should know the pH value of your soil so that you can accurately predict how well your new garden will grow. Plants typically do best in soil that has a pH level between 6.0 and 6.9. Lime and manure help to raise acidity or alkaline levels to the desired amount. One issue to keep a watchful eye out for is the levels of clay and sand found within the soil. Too much can pose a serious threat to all gardening efforts. If there is a high concentration, consider mixing in a few inches of compost to increase the amount of organic matter within your land. Once levels are acceptable, you’ll be ready to install that new garden. In order for plant life to grow and thrive it needs level land. You can ensure this by raking all of your flower beds. Also, you’ll want to remove larger rocks. Smaller rocks aid in drainage, so those can stay. This presents the perfect time to take note of how flat your property is. This will help you decide if you need to invest in any sloping options, such as a retaining wall. If leaves have finished falling for the season and have been removed from all flower beds, it is a good idea to begin applying mulch to make way for accelerated plant growth. Organic and inorganic debris should be removed prior to landscaping. Organic debris includes dead plants, weeds, rocks, leaves, food and vegetable waste, and woody materials. Inorganic debris can include plastic bags and other household waste. Any and all animal waste should also be removed from any area you’re looking to landscape. Weeds can be removed by hand pulling them out by the roots, or by using certain post-emergence herbicides. Leaves and dead plants don’t have to be tossed out. They can be repurposed and added to a compost pile if you’re using one. If you’re going to be adding new plants, shrubs, or trees, the last thing you want is a spreading infection brought on by existing fungal diseases. These afflictions release airborne spores which can infect healthy plants, endangering your landscaping efforts before they even begin. Severe fungal infections require the removal and destruction of the plant to prevent the spread of spores. If a section of an otherwise healthy plant is infected with a fungus, it is sometimes possible to cut that bit away and destroy it, saving the original plant in the process. If an infection happens to be less severe, using an appropriate fungicide could solve the problem. However, if taking this less destructive route, ensure that the infection is eradicated before moving ahead with landscaping. Look for clear signs that invasive insects are present before giving them brand new vegetation to snack on. One tell tale sign that there are harmful insects nesting in your soil is the presence of the predators who eat them. If you see signs of nocturnal critters digging through your garden, there is sure to be something within that’s drawing them. Apply insecticide and/or larvicide to prevent worm reproduction. This will eliminate their ability to multiply and keep away the creatures that hunt them. Softscape features such as plants, bushes, vegetation, and trees that don’t fit into your new landscaping plan need to be removed and can be taken out fairly easily. Hardscape features are decidedly more difficult to eliminate. These can include fountains, paving, retaining walls, foundation, in ground pools, and patios. The removal of hardscape features will require heavy machinery and is best left to professionals. 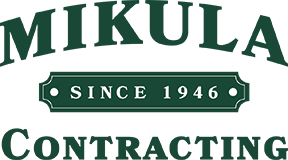 Mikula Contracting has been specializing in residential contracting services throughout New Jersey for over 70 years. Our residential demolition and disposal services can eliminate most hardscape features. We can remove concrete slabs, in ground pools, garages and even whole houses to make way for new and exciting landscaping. What’s more, we can undertake drainage and excavation work to ensure that your property is prepared for whatever grand vision you may have. Our residential services extend to Essex, Hudson, Bergen, Passaic, Morris, and Union Counties. For more information on Mikula Conracting, visit us online. For a fast quote, contact us today.